This recipe for these Easy Classic Date Squares will quickly become a household favorite -unsweetened Medjool dates sandwiched between layers of oat crumble. 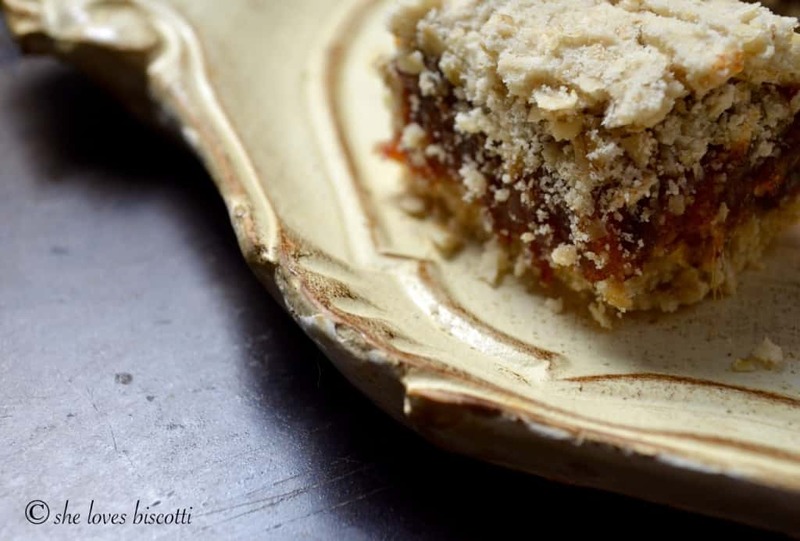 These date squares will provide you with old-fashioned goodness in every bite. Happy Sunday! Every Sunday, I collaborate with other “Sunday Supper” bloggers on a theme. Since next week-end is Mother’s Day, and since it also fits with today’s Sunday Supper theme, I thought it would be appropriate to share these Easy Classic Date Squares with all of you. Mother’s Day – it’s complicated, isn’t it? North American tradition will dictate that the second Sunday of the month of May is Mother’s Day. A day set aside to honor mothers and motherhood, and to think of our mothers and children, and the experiences we’ve had with them, what could have been, what should have been… For so many of us, Mother’s Day brings a lot of joy and cause for celebration. Unfortunately, there are also so many women that experience a sense of sadness and loss on this day. I came to this understanding in the weeks that followed my mother’s passing. Having lost my mom at an age that I considered too young… I can honestly say that today, I am in a place of acceptance and gratitude. But I had my moments of anger and sadness and the textbook stages of dealing with grief. This was especially true the first Mother’s Day that I had no mother to celebrate. My Mom was the kind of mom that Hallmark would make cards about – kind, compassionate, thoughtful, selfless, supportive, and unconditionally loving. I felt very privileged for having had such a wonderful mother, and for having had such a wonderful relationship with her. When she passed, friends and family came together to tell me how my mother had supported them through their own journeys… guided them through the difficult issues concerning their own mothers and motherhood. It just solidified my belief that my mom was truly a special woman. It was difficult to face each day without my mother at first. But today, I’ve come to appreciate and better understand that healing is a process. Somehow this process becomes easier if we have faith in it and acknowledge it. Always striving to be in a place of gratitude and not taking relationships for granted is the work that needs to be done everyday… for some of us it’s easy… for others, it’s a little bit more of a struggle. Mother’s Day… don’t be so hard on yourself. My message is to acknowledge and bring a sense of encouragement to those that find Mother’s Day challenging. 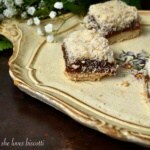 My beautiful daughter asked me why I chose this recipe for Date Squares for a Mother’s Day post. Isn’t that a great question? I thought I would share my answer with all of you just in case any of you were wondering the same thing. For starters, my mom loved this recipe. We would often sit and chat over the date squares together, and those are memories I cherish very much. And, for reasons I cannot explain, this recipe also conjures up visions of old-fashioned goodness and innocence. It has a timeless dimension to it. I can imagine a grandmother, lovingly making these date squares for her grandchildren (and of course, her own adult kids). I am also attracted to the simplicity of this recipe. There are so few ingredients, and they come together so easily. The date filling: I LOVE dates. They are naturally sweet and are truly nutritional powerhouses. I have already shared a few recipes which highlight dates. (If you are interested, you can see my Ricotta Stuffed Medjool Dates, these Date Bran Muffins and these Almond Date Biscotti). The date filling for these Easy Classic Date Squares is made by simmering dates with water, lemon juice and just a little bit of cornstarch. I also like to add a little bit of lemon zest. Remember to keep the heat low and to stir occasionally to prevent scorching. Once the dates are cooked, you can set them aside to cool off while you prepare the oat crumble mixture. The oat crumble mixture: This mixture really comes together so easily. I basically combine all the dry ingredients together. I then incorporate the grated butter with my fingers. You will see that the dough will be extremely crumbly, but if you squeeze it, it should hold. At this point it’s just a matter of layering and baking your Easy Classic Date Squares. I found the inspiration for this recipe in the food section of the newspaper, the Ottawa Citizen. This one dates back to 2006. I have made my usual changes to the recipe – I totally eliminated the brown sugar in the date filling, since I think that dates are sweet enough, and I decreased the amount of salt. I also wanted to bring your attention to the tray. I borrowed it from my sister, who hosted us for Easter. She mentioned that she had inherited the tray from her mother-in-law. It was truly a perfect match for the date squares. This recipe for these Easy Classic Date Squares is the perfect dessert any time of the year. As a final thought, I would like to dedicate this recipe for these Easy Classic Date Squares to my mom and to my sister’s mother-in-law. ★★★★★ If you have made this Date Square recipe, I would love to hear about it in the comments below and be sure to rate the recipe! Combine the dates, water, lemon juice, zest and cornstarch in a medium sized saucepan. Cook on very low heat for about 8 minutes, stirring occasionally. Remove from heat and set aside to cool down. Combine all the dry ingredients together except the butter. Grate the butter over the dry mixture. With your hands, incorporate the butter in the oat crumble mixture. The dough should be crumbly, but if you squeeze it together, it should hold its’ shape. Spray an 8 x 8 square pan with non-stick vegetable spray. Press about 2/3 of the total oat crumble mixture at the bottom of a square pan. Bake in oven for about 5-8 minutes. Spread the date filling over the base. Crumble the remaining oatmeal mixture over the top of the date filling. Press lightly with fingertips. Bake in the pre-heated 350 oven for about 25-30 minutes. Cool completely in pan before cutting into squares. 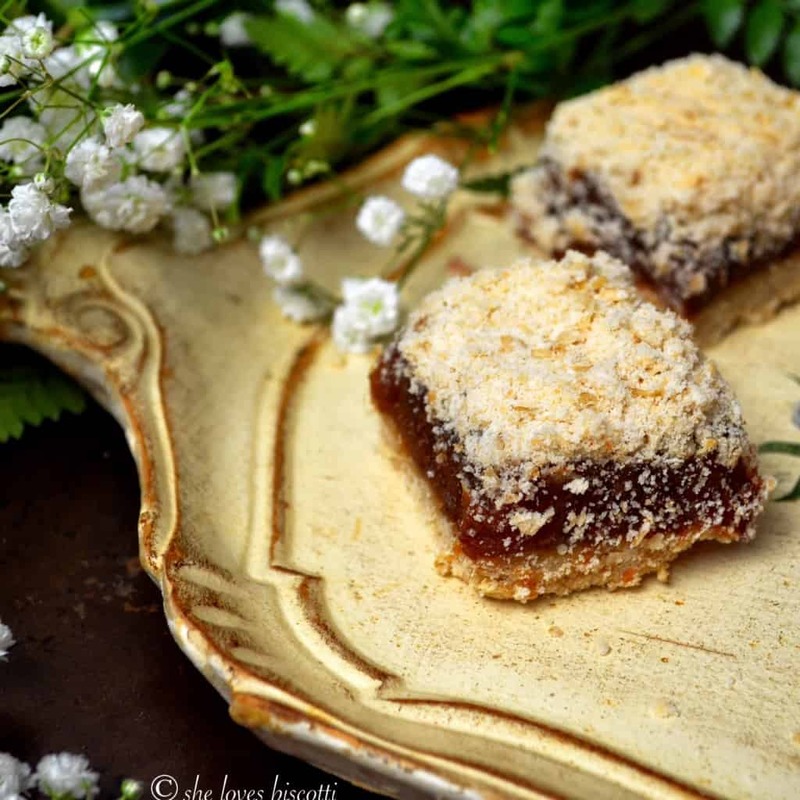 LOVE THIS RECIPE FOR DATE SQUARES? PIN IT TO YOUR DESSERT BOARD! Every Sunday, there is a wonderful group of bloggers called the #SundaySupper tastemakers that collaborate together on a theme. As was mentioned, today’s theme was Mom’s Favorite Recipes and I think you’ll agree the line-up of recipes is totally amazing! I would like to thank the event hosts for this event: Christie Campbell of A Kitchen Hoor’s Adventures and Wendy Leep Hammond of Wholistic Woman. Thanks Christie and Wendy! Add cornstarch before cooking date mixture or after it cools? 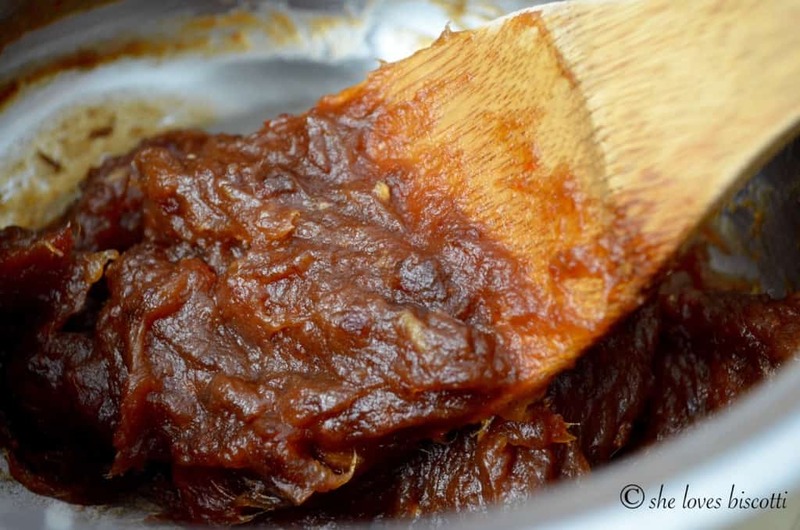 Thank you for sharing this post, I love dates and I must try this recipe . I love the ease of this recipe. Plus I have all the ingredients in my kitchen right now. Must try this. Thanks for sharing! Thank you for sharing your story. This is my first Mother’s day without my Mom and I have a double whammy because my Mother in Law passed away one month and one day after my Mom. The pain is real. That being said I am so glad you posted these wonderful bars along with the memories of your Mom. I think I would have a hard time returning that incredibly beautiful platter. Wendy, I am truly sorry for your losses… I can only imagine what you are going through… we must draw our strength in the wonderful memories. 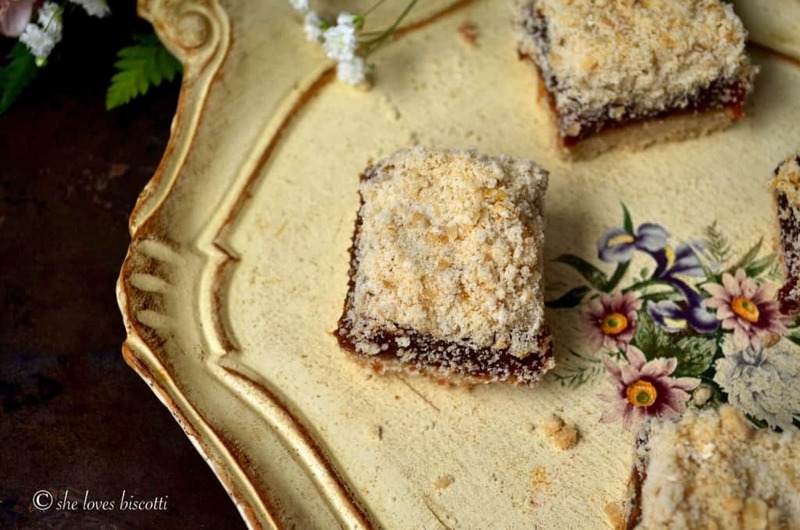 Your date squares look wonderful and you’re right, they do have a timeless, old-fashioned appeal. I like the idea of the lemon juice and zest in the filling too -it must add a nice balance. These look so tasty. How lucky that you had such a wonderful mom and have such warm memories. What a beautiful post…I’m so sorry for your loss. Hopefully recipes like this will help you fill the void and be closer to her. They look amazing! This is such a beautiful post Maria. Thank you for sharing your lost and the journey that followed. Your date squares look delicious!! 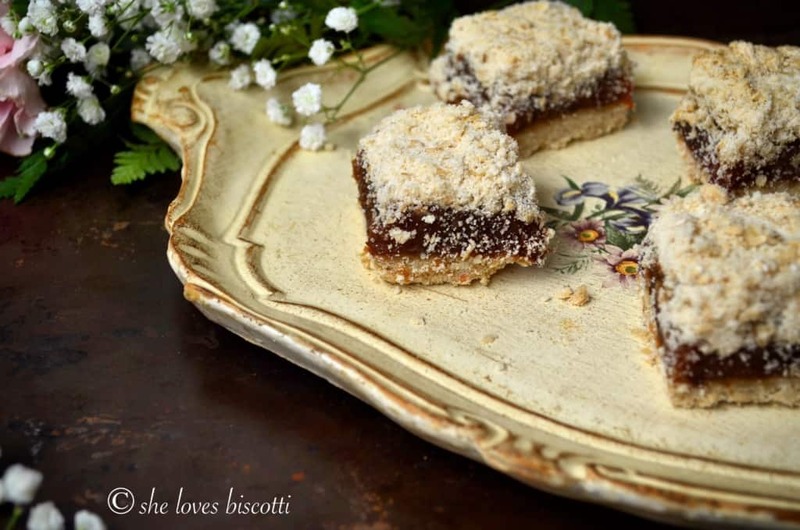 Such a classic recipe – growing up in Cape Breton, Nova Scotia date squares were a staple in our diet. I’ve never made them myself but you have motivated me to do so!! Loving participating in #SundaySupper. So much inspiration from the great recipes that are shared each week. So heartfelt. Thanks for sharing your memories of your mother. Love that the tray has a special meaning as well. And, dates – well – one of my all-time favorites. Thanks so much for this beautiful piece. I love this post about your mom. I can’t imagine losing mine. I also love the tray and these date bars. I haven’t done a whole lot with dates, but have enjoyed the few things I have done. I know I would love these bars, a pot of coffee and a great chat with my mom and grandma! I’m so sorry you lost your mom at a young age. I can’t imagine how tough that must have been for you. I have been looking forward to seeing your recipe and it did not disappoint. I love dates too! Thanks Laura. That’s very kind of you. Loved reading your post Maria. Your date squares look delicious. Happy Mother’s Day to you and your family. I am so sorry that you have lost your mom, it does make Mother’s Day bittersweet for you. . This is a beautiful post, Maria. I loved reading about your mother and getting to know her lovely daughter a bit more through the story. Your date squares look chewy and wonderful. Everything a date square should be. Très bel hommage à ta maman! Touchant!! 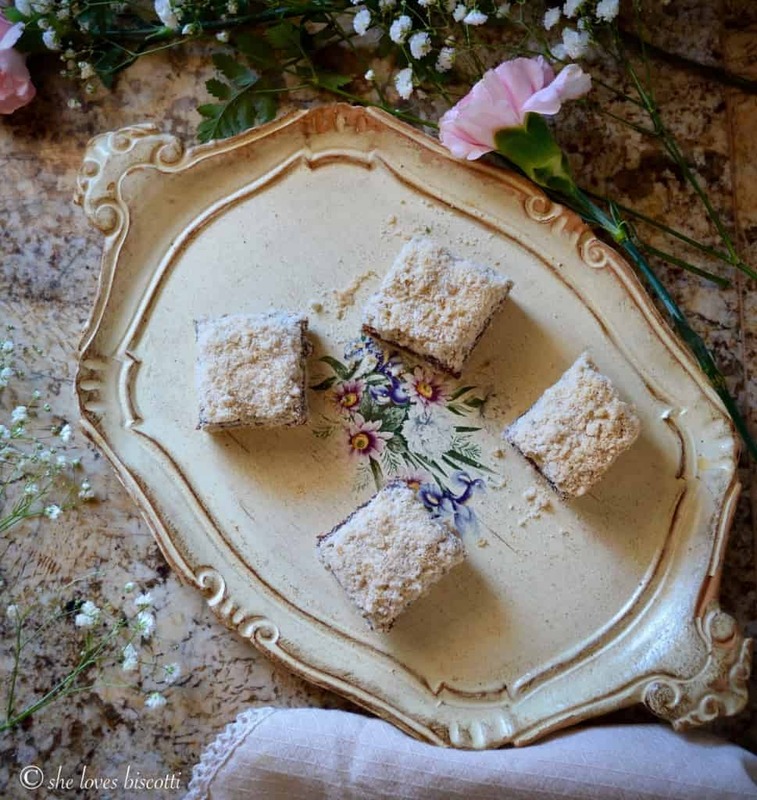 These look really delicious, and thanks for sharing your thoughts of mother’s day so honestly – it’s true this as with other days take on quite a different meaning when a loved one passes. Thank you for sharing your heart along with this recipe. Isn’t it great how food can bring back such powerful memories?